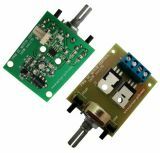 PWM DC MOTOR CONTROL, 300W, 12 - 32VDC with feedback from an encoder PWM DC speed ​​regulator of a electric motor with torque preservation, 300 W, 12 - 32 VDC. PWM DC MOTOR CONTROL 140W PWM DC motor control with maximum power limit 140 W and power supply 12- 32 V.
PWM DC MOTOR CONTROL tacho, 140W, 12 - 20VDC with feedback from a DC current tachogenerator PWM DC speed ​​regulator of a electric motor with torque preservation, 140 W, 12 - 20 VDC. PWM DC Motor 1200W from 12VDC to 180VDC PWM DC 1200 W regulates DC motor rotations or LED light intensity. List Price 16.90лв. VAT Incl. 16.05лв. VAT Incl. 15.21лв. VAT Incl. 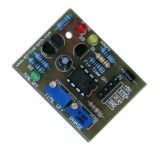 PWM DC 300W Motor Controller, 12-24VDC PWM DC 300W Motor Controler is based on contemporary microcontroler and SMD components thus achieving small size and stability. The device regulates DC motor speed and LED brightness. Supply voltage 12 to 24 VDC and maximum power of the load 300 W.
PWM DC 600W Motor Controller, 12-180VDC PWM DC 600W Motor Controler is based on contemporary microcontroler and SMD components thus achieving small size and stability. The device regulates DC motor speed and LED brightness. Supply voltage 12 to 180 VDC and maximum power of the load 600 W.
PWM DC 140W Motor Controller, 7.5-20VDC PWM DC 140W Motor Controler is based on contemporary microcontroler and SMD components thus achieving small size and stability. The device regulates DC motor speed and LED brightness. Supply voltage 7.5 to 20 VDC and maximum power of the load 140 W.
List Price 26.90лв. VAT Incl. 25.55лв. VAT Incl. 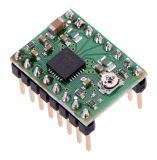 H-Bridge Driver Rev 1.05, 12VDC/0.5A, 200W The H-Bridge Driver is designed to control the direction of rotation of DC servomotors. It is based on two IRF2184 drivers and four IRFP3710 MOSFET transistors.